PC games are more resource intensive and take up more space. Cross-platform gaming is still in a nascent stage. Most attempts at it have been unsuccessful. The few options include the Bluetsacks emulator, which allows Android games on PCs, and Sony’s Play Station Now platform, which can run PS3 games on a Windows PC. But getting a PC game to run on a smartphone is a different ball game, as PC games are more resource intensive and take up more space. Cloud gaming companies such as OnLive have tried and failed at it. Now a New York, US-based gaming company LiquidSky has come with a cloud-based app which can run any PC game on your smartphone and surprisingly you don’t need a OnePlus 5-like device to run it. The minimum system requirement for the smartphone is just 1GB RAM and 30MB of storage. The games will be downloaded on cloud, so you don’t have to worry about the storage on your smartphone at all. LiquidSky recommends wired controllers for the best gaming experience. However, it requires an active internet connection with minimum bandwidth speed of 5Mbps and recommended speed of up to 20Mbps for the best gaming experience. Online gaming is not new to the mobile ecosystem. Many Android games require active internet connection to work, however getting the 20Mbps mark consistently is going to be a challenge, especially on mobile networks in India. This makes it heavily dependent on WiFi networks. Liquid Sky works by connecting smartphones to a virtual PC running on cloud. The actual game will be downloaded and run on a remote server, which will then compress and stream the game on users’ smartphone at frame rate of 60fps. LiquidSky is available only for Android devices right now. Once users sign up in the app, and take a subscription plan, they can browse and download any games from their existing library of purchased games or buy new ones on Steam, GOG, Origin, Blizzard or Humble Bumble. These are online stores for PC games and their API (application programme interface) is built into the app, so one doesn’t have to download their apps separately. LiquidSky is available only for Android devices right now and can be downloaded from the Google Play Store (there is no news on the iOS app yet). Users in India can download it for free but to access the games, one of the subscriptions is required. Basic Pay-as-you-go plan starts at $9.99 (approximately Rs644) and provides 100GB of storage. The monthly subscription, which offers 500GB of cloud storage and the option to change data centres, starts at $19.99 (approximately Rs1,289) per month. There is a free model too, with in-app advertisements and 100GB storage, but its only available to users in the US and Canada. LiquidSky uses IBM’s public cloud infrastructure which is more robust, easy to scale and has got data centres spread across the globe. One of the reasons for the failure of services such as OnLive was that it used its own servers to host the games and was unable to put up with the cost. Also, they failed to acquire top-tier games form leading game developers such as EA Sports and Activision. The biggest highlight of Liquid Sky is that you can purchase, download and play any PC game that is available on one of the linked game stores. Why do you need controllers? Technically. PC games are not designed for touchscreen devices. You need a controller or a mouse and keyboard to play them. 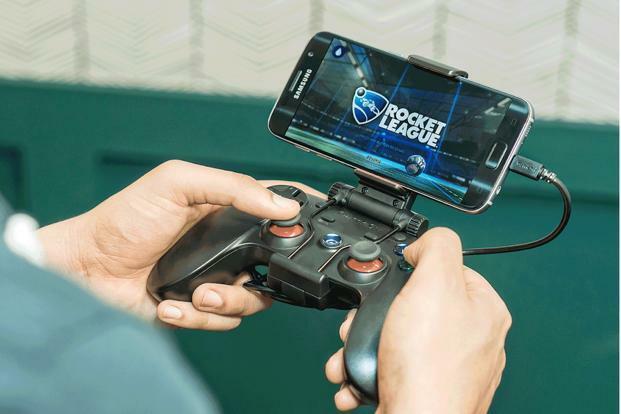 Smartphone users won’t be able to run them through on-screen controls and will require a compatible Android controller, which can be connected to the phone with an OTG cable or wirelessly over Bluetooth. LiquidSky recommends wired controllers for the best gaming experience.